Local media reports that the 29-year-old man was arrested for building up a stash of weapons and explosives. 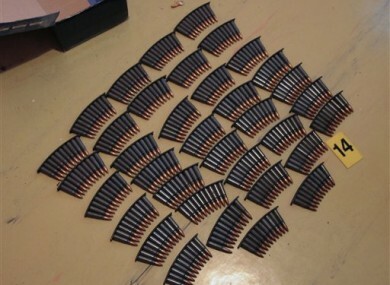 This undated handout picture showing ammunition seized by police was provided to the media by Czech Police in Ostrava today. A man believed to be a sympathiser of Norwegian mass killer Anders Behring Breivik has been arrested in the Czech Republic for building up a stash of weapons, explosives, a detonator and an automatic rifle at his home, according to local media reports. The 29-year-old man, living in the eastern city of Ostrava, had used Breivik’s name in email communication, Czech news agency CTK reported Saturday. He was arrested Aug. 10 in Ostrava. Police would not comment further on the apparent Breivik link. “In a home search we’ve found computer equipment, weapons, ammunition and explosives,” CTK quoted Ostrava criminal police head Radovan Vojta as saying. Email “'Breivik sympathiser' arrested in Czech Republic”. Feedback on “'Breivik sympathiser' arrested in Czech Republic”.